8 delicious dishes you need to try outside of KL! 2016 is coming to a close and as we usher in the Christmas season, many of us will also be getting geared for the long holidays. School is out and it’s time to clear your work leaves! While some of us may go overseas for their annual vacation, most will likely head out to our local attractions, which have their own unique charm and delights. If you’re heading to Johor Bahru, Penang, Malacca or Kota Kinabalu, you’ll be amazed at what each state has to offer. Even as we go and visit museums and theme parks to white sandy beaches, we cannot forget the most important part about any holiday, the makan!. Just follow our list here for some confirm sedap makan lobangs that our Grab drivers swear by. If there’s anything else that should be here, do let us know and we will be sure to check it out. All of us Grabbers love food and are always looking out for more places to try. So book a Grab to these places and loosen your waist belt because it’s time to feast! Usually at the end of the year it can get quite rainy so what better way to enjoy the cool weather than with a steaming hot bowl of delicious soup? If you want something hearty and rich, do head over to ZZ’s Sup Tulang shop which has become popular among the locals. You may know that they have a branch with a more rustic and natural setting in Kampung Bahru but we went to the branch in Setia Tropika. Do not worry though, the standards are pretty much the same and just as good as the original branch. 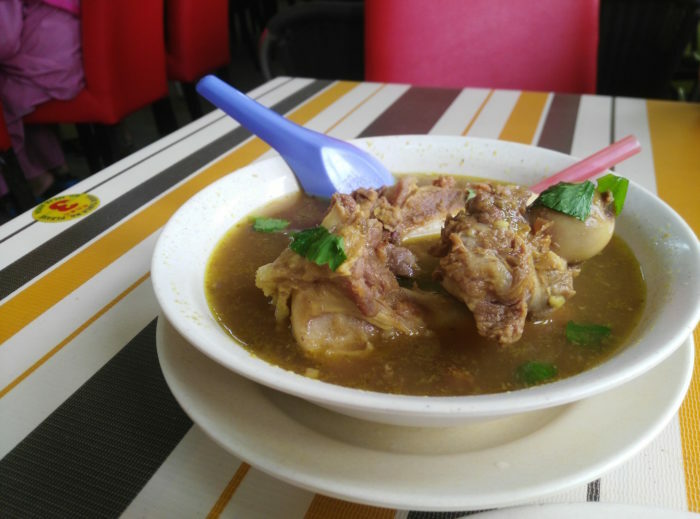 The usual modus operandi : thick broth slow boiled with Malay spices and lamb shank bones, maintaining the flesh’s tenderness and imbuing it with flavor. Take your time as to savor each bite of lamb meat as they melt away from the bone. The highlight when eating this dish is sucking the succulent bone marrow out of the hollow of the bone with the straw provided. This is pure genius which makes the trip to this restaurant so worth your while. If you check out other reviews online of this place, they also recommend having a go with their Mee Rebus which is also topped with lamb shanks! Rating : 4.5 outta 5 Grab Rides! 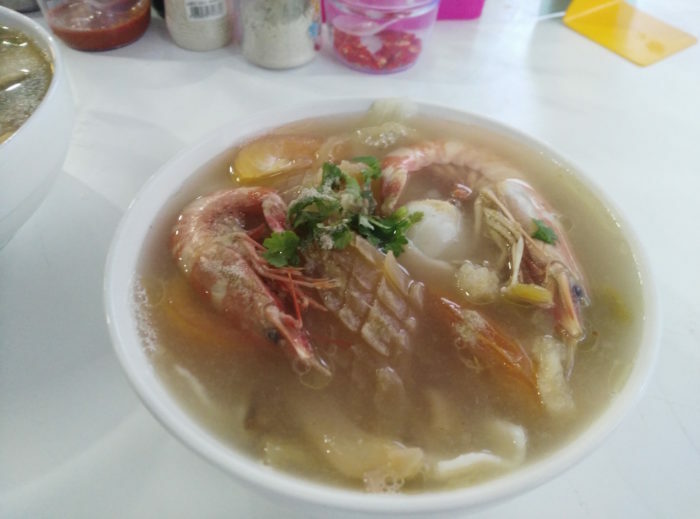 Of the non-halal variety, many have recommended visiting Gan Heong Seafood Noodle Shop. 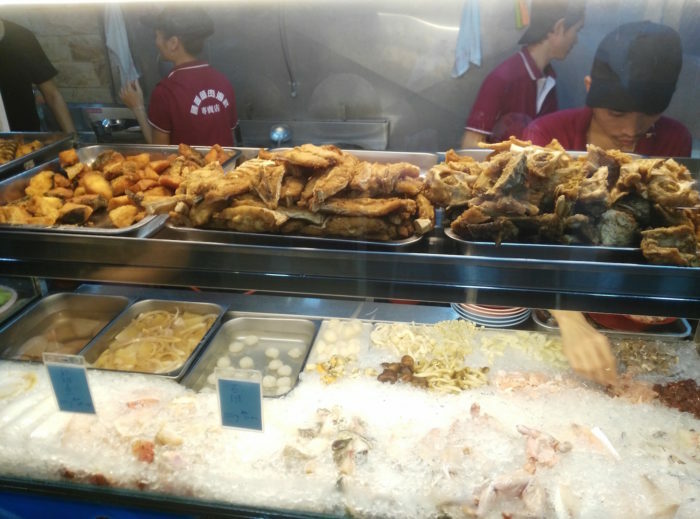 Located in Taman Daya, this shop boasts a variety of fresh and deep fried seafood toppings for your soup; you can even add frog legs to your dish! But the real star of their dishes is the soup. The soup itself is a combination of pork and chicken bones as well as seafood, which gives it a rich and flavourful taste. Prepare for a burst of flavour when you sip that soup! Malaccans take special pride in their city not only for its rich history and traditional architecture but also its sumptuous food. Some of their most popular local dishes are of the Peranakan kind, which incorporates Chinese ingredients with Malay cooking techniques. 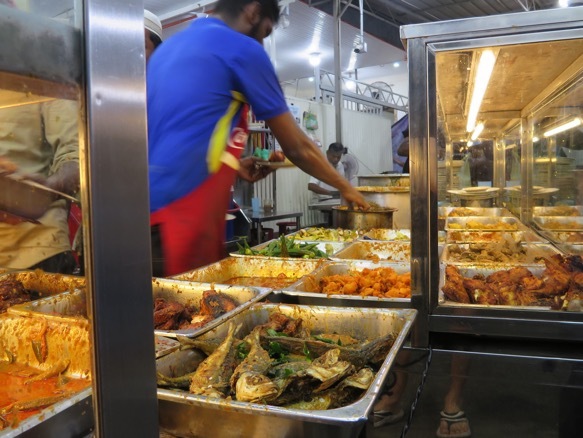 Many foodies across the globe will travel all the way to Malacca just to sample this unique cuisine. It goes without saying that if you’re looking for one of the best places to try Peranakan food, look no further than Nancy’s Kitchen. Nancy’s Kitchen name has travelled far due to word of mouth from foodies online. When one thinks of Peranakan food in Malacca, this place immediately comes to mind. Don’t let the humble looking dishes fool you…each dish is cooked with love. Due to the intermarrying of cooking styles from the olden days, the flavors are complex and rich in taste. Be warned – Peranakans love their food spicy. Be prepared to wipe sweat off your brow as you tuck in. 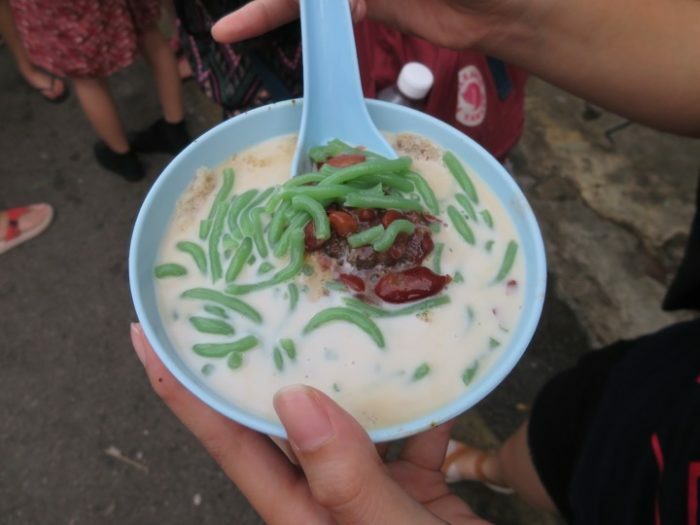 To cool off, order their highly popular cendol to complete the meal. Many say that if you want a refreshing drink, drink coconut water. But what if it was in the form of a milkshake? Yeap, mind-blown – This is a marriage made in heaven. Refreshing coconut juice with soft flesh and ice shavings topped with vanilla ice-cream. 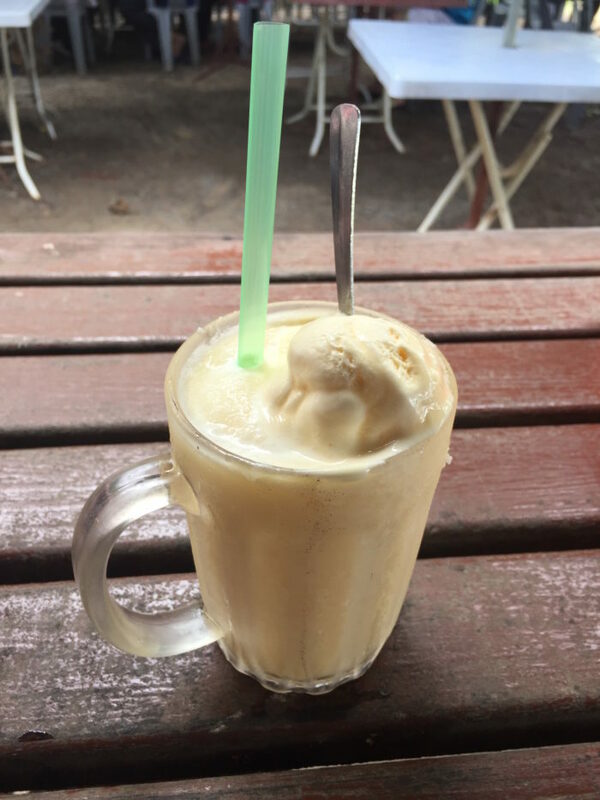 We’re not sure why no one else had thought about this earlier when Malaysia has such hot weather, but we’re giving props to the creators of this delicious icy, creamy drink. However, be prepared to get in line as this stall is synonymous for having long queues (it is definitely worth the wait though!). You can also try the packed nasi lemak which is affordable and the sambal is “super power” too. When we ask people what they most look forward to eating when arriving in KK, they answer: super fresh seafood. This is why our top 2 recommendations revolve around seafood! After a day of island hopping, dine on a variety sashimi-fresh seafood straight from the ocean. This restaurant is a local secret; not many out-of-towners know of this place. 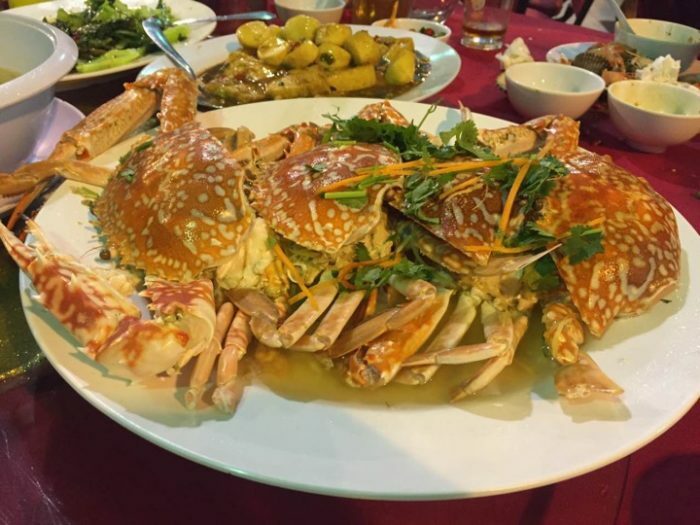 From groupers to sea snails, there is a plethora of seafood to choose from at Shuang Tian Seafood Restaurant. To order, select the unlucky sea creature you wish to dine on and tell the waiter/waitress how you would like it to be cooked. Everything is worth trying so we can’t really give you a specific recommendation (just ask the staff for what in the day’s catch they suggest) for what to eat but the quality and freshness of the seafood here is something to behold. 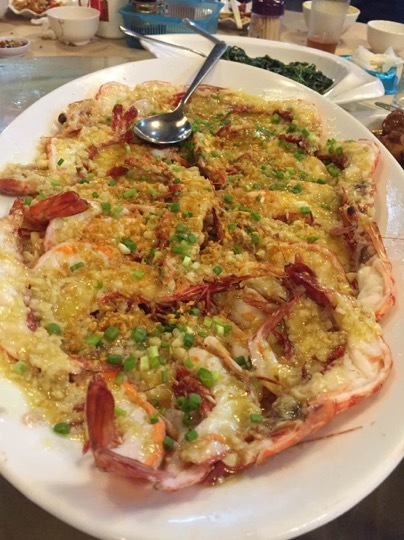 Our personal favourite is the garlic baked king prawns and steamed flower crabs. As usual, be prepared to wait for quite a while for an empty table during dinnertime. Rating : 5 outta 5 Grab Rides! Now you may be wondering: how did a Tom Yam dish end up on the list? Tom Yam is such staple menu item in many eateries in Malaysia that it’s easy to forget that the dish was originally from Thailand. Many of these eateries have added their own spin on it and one of them is Ah Chee Tom Yam Kopitiam in Segama. 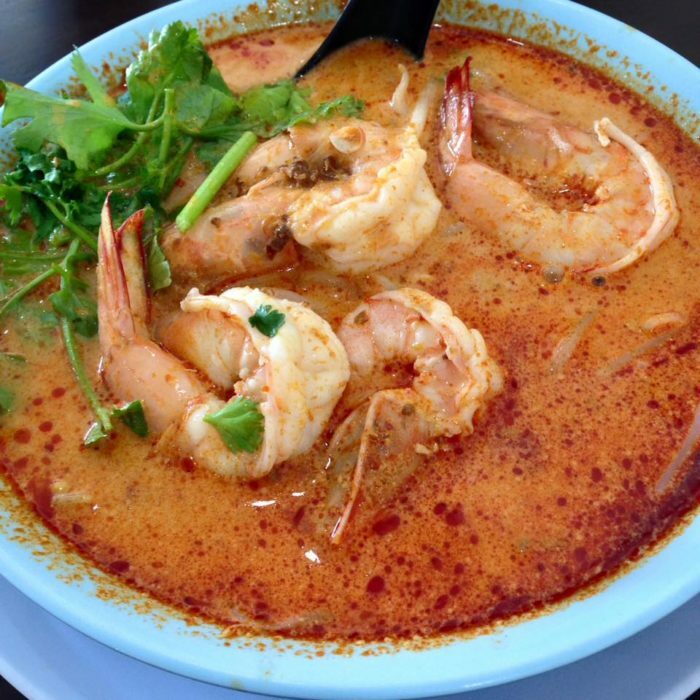 The signature dish here is the Tom Yam Prawn Noodles which is still cooked individually by the owner. The spicy tom yam broth is boiled together with a homemade sambal paste that elevates the dish and gives the broth an extra kick. Cooked bee hoon is then submerged, and the soup is topped up with fresh local sea prawns. Finally, the owner adds one magical ingredient to the soup: fresh milk, which gives the broth a creamy and rich flavour. Savour this spicy, creamy broth with fresh prawns and you’ll be in seventh heaven! For adventurous foodies or those who enjoy an extra side of pain when eating, you can ask the owner to adjust the spiciness level to your liking. We normally ask for the max level for that ultimate shiok burn! Lot 8, Shop No.19 Segama Complex. Many Malaysians and travellers alike knows that Penang is the major food capital in Malaysia. Many are willing to drive long hours all the way up North just to eat and nothing else. Some of us in Grab are guilty as charged when we say that we did nothing in Penang but eat. Penang is a melting pot of different cultures and cuisines. Awesome Malay food? Check. Awesome Chinese food? Double check. Awesome Indian food? Triple check. Awesome Nyonya food? Quadruple check! You can be rest assured that even if you main tikam at choosing a place to eat in Penang with your eyes closed, chances are it’s gonna be good and affordable. If you’re famished and want to dig into a plateful of rice smothered in flavoursome curries, look no further than Deen Maju Nasi Kandar. 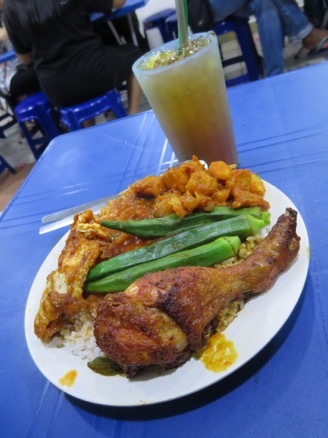 It’s right now the hottest place to eat nasi kandar – literally. This is because many will queue under the hot sun as early as 4pm. Choose from either white or tomato rice and pick your side dishes to add onto your rice like fish roe curry, fried chicken or chicken liver. Finally, to complete your pile, put on a generous lather of curry sauce which you can choose from. Take a spoonful and prepare for a riot of flavours in your mouth. An important tip is to get there early as they run out of the good stuff as early as 9pm! If you’re from KL, you’d probably have come across a few branches of this famous chendol stall originating from Penang. 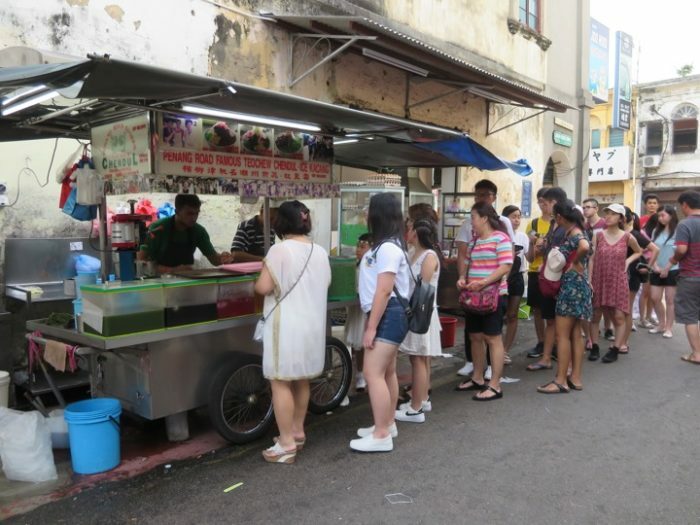 Despite the massive expansion of their business outside of Penang, the owners still operate from a humble road side stall in Penang with long lines of customers. 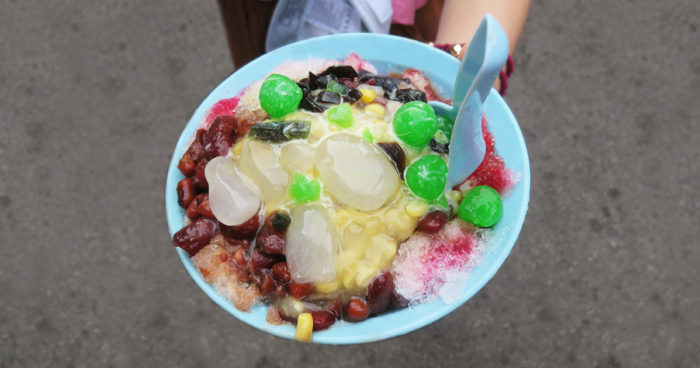 Slurp on melting shaved ices drowned in coconut milk and sweet gula melaka while munching on red kidney beans and pandan-flavored stringy noodles made from palm flour. This icy sweet dessert is heaven-sent on hot days or after a round of nasi kandar. How many of these places have you tried and do you agree with our reviews? For those that you have yet to try, remember that you can easily take a Grab to these places to enjoy the dishes listed here! In fact, from now until 2 December, Grabbers will enjoy RM5 off 100 ride to anywhere in Johor Bahru,Penang,Kota Kinabalu and Malacca! Check out the deets here.